Choline /ˈkoʊliːn/ is a water-soluble vitamin-like essential nutrient. It is a constituent of lecithin, which is present in many plants and animal organs. The term cholines refers to the class of quaternary ammonium salts containing the N,N,N-trimethylethanolammonium cation (X− on the right denotes an undefined counteranion). The cation appears in the head groups of phosphatidylcholine and sphingomyelin, two classes of phospholipid that are abundant in cell membranes. Choline is the precursor for the neurotransmitter acetylcholine, which is involved in many functions including memory and muscle control. Choline was first isolated by Adolph Strecker from pig and ox bile (Greek: χολή, chole) in 1862. When it was first chemically synthesized by Oscar Liebreich in 1865, it was known as neurine. In 1898 neurine was shown to be chemically identical to choline. In 1998, choline was classified as an essential nutrient by the U.S. Food and Nutrition Board of the Institute of Medicine. Choline and its metabolites serve three purposes: structural integrity and signaling roles for cell membranes, cholinergic neurotransmission (acetylcholine synthesis), and a source for methyl groups via its metabolite, trimethylglycine (betaine), which participates in the biosynthesis of S-adenosylmethionine (SAM). The human body can produce choline by methylation of phosphatidylethanolamine by N-methyltranferase (PEMT) to form phosphatidylcholine in the liver, or it may be consumed from the diet. The function of choline is complex, and involves interplay with folate, methionine, and vitamin B12. Methionine can be formed either from methyl groups derived from folate, or from methyl groups derived from betaine, which in turn receives its methyl groups from choline. Changes in one of these pathways are compensated for by the other. If neither pathway provides adequate methylation to produce methionine, its precursor, homocysteine, rises. Choline in food exists in either a free or esterified form (choline bound within another compound, such as phosphatidylcholine, through an ester linkage). Although all forms are most likely usable, some evidence indicates they are unequally bioavailable (able to be used by the body). Lipid-soluble forms (such as phosphatidylcholine) bypass the liver once absorbed, while water-soluble forms (such as free choline) enter the liver portal circulation and are generally absorbed by the liver. Some animals cannot produce choline and must consume it through their diet, though humans can make a small amount of choline in the liver. Diets lacking choline lead to fatty liver and muscle damage, though this effect varies amongst age groups, with men and postmenopausal women more susceptible than premenopausal women. However, choline deficiency is rare in the general population. The following are choline values for a selection of foods in quantities that people may consume in a day. Cruciferous vegetables, such as Brussels sprouts and broccoli, are good sources of choline. USDA's food composition database lists the choline content for many foods. In the USA, the National Academy of Medicine (formerly the Institute of Medicine) has not published a Recommended Dietary Allowance (RDA) for choline due to lack of a consensus, though it is recommended as an essential nutrient with established Adequate Intake (AI) values. However, the NAM notes that these figures are limited as they are based on a single study. The European Food Safety Authority also does not provide a Recommended Daily Intake, indicating that there are "no indications of inadequate choline intakes available in the EU". However, the information on choline content of many foods from outside of North America is limited, making it difficult to accurately estimate choline intake in Europe. They do, however, join the United States in providing a recommended Adequate Intake value. The Australian and New Zealand national nutrition bodies also note no reports of choline deficiency in the general population. Australia, New Zealand and Canada use the figures published by the National Academy of Medicine, while the European Food Safety Authority (EFSA) published its Adequate Intake values most recently in 2016. In the United States, nutritional labels express the amount in a serving as a percentage of Daily Value (%DV) based on the AI. For choline, as shown in Reference Daily Intake, 100% of the Daily Value is 550 mg.
Choline deficiency may play a role in liver disease, atherosclerosis, and possibly neurological disorders. One sign of choline deficiency is an elevated level of the liver enzyme ALT. If low choline intake causes an elevated homocysteine level, it raises the risk for preeclampsia, premature birth, and very low birth weight. Involvement of choline in long-term health and development of clinical disorders, such as cardiovascular diseases, cognitive decline in aging and regulation of blood lipid levels, has not been well-defined. The US Food and Drug Administration requires that infant formula not made from cow's milk be supplemented with choline. Choline-providing dietary supplement ingredients include: choline chloride, choline bitartrate, citicoline (CDP-choline), L-alpha-glycerophosphocholine (Alpha-GPC), lecithin, phosphatidylcholine. Both pregnancy and lactation increase demand for choline dramatically. This demand may be met by upregulation of PEMT via increasing estrogen levels to produce more choline de novo, but even with increased PEMT activity, the demand for choline is still so high that bodily stores are generally depleted. This is exemplified by the observation that Pemt -/- mice (mice lacking functional PEMT) will abort at 9–10 days unless fed supplemental choline. While maternal stores of choline are depleted during pregnancy and lactation, the placenta accumulates choline by pumping choline against the concentration gradient into the tissue, where it is then stored in various forms, mostly as acetylcholine. Choline concentrations in amniotic fluid can be ten times higher than in maternal blood. 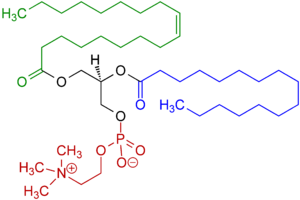 Choline is in high demand during pregnancy as a substrate for building cellular membranes, (rapid fetal and mother tissue expansion), increased need for one-carbon moieties (a substrate for addition of methylation to DNA and other functions), raising choline stores in fetal and placental tissues, and for increased production of lipoproteins (proteins containing "fat" portions). In particular, there is interest in the impact of choline consumption on the brain. This stems from choline's use as a material for making cellular membranes, (particularly in making phosphatidylcholine). Human brain growth is most rapid during the third trimester of pregnancy and continues to be rapid to approximately five years of age. During this time, the demand is high for sphingomyelin, which is made from phosphatidyl choline (and thus from choline), because this material is used to myelinate (insulate) nerve fibers. Choline is also in demand for the production of the neurotransmitter acetylcholine, which can influence the structure and organization of brain regions, neurogenesis, myelination, and synapse formation. Acetylcholine is even present in the placenta and may help control cell proliferation/differentiation (increases in cell number and changes of multiuse cells into dedicated cellular functions) and parturition. Choline uptake into the brain is controlled by a low-affinity transporter located at the blood-brain barrier. Transport occurs when arterial plasma choline concentrations increase above 14 μmol/l, which can occur during a spike in choline concentration after consuming choline-rich foods. Neurons, conversely, acquire choline by both high- and low-affinity transporters. Choline is stored as membrane-bound phosphatidylcholine, which can then be used for acetylcholine neurotransmitter synthesis later. Acetylcholine is formed as needed, travels across the synapse, and transmits the signal to the following neuron. Afterwards, acetylcholinesterase degrades it, and the free choline is taken up by a high-affinity transporter into the neuron again. While folate is most well known for preventing neural tube nonclosure (the basis for its addition to prenatal vitamins), folate and choline metabolism are interrelated. Both choline and folate (with the help of vitamin B12) can act as methyl donors to homocysteine to form methionine, which can then go on to form SAM (S-Adenosyl methionine) and act as a methyl donor for methylation of DNA. Dietary choline deficiency alone without concurrent folate deficiency can decrease SAM concentration, suggesting that both folate and choline are important sources of methyl groups for SAM production. Inhibition of choline absorption and use is associated with a 2.4-fold higher risk of neural-tube defects in humans. Some studies have shown higher choline levels in the blood and increased dietary intake to be associated with better memory, though others have not shown a consistent effect. The human mammary gland is composed of several cell types, including adipose (fat cells), muscle, ductal epithelium, and mammary epithelium (referred to sometimes as lactocytes). The mammary epithelium is the site for excretion of raw materials into the milk supply, including choline. This occurs, for the fat portion of the milk, by apocrine secretion, where vacuoles containing materials bud off the cell into the lumen (storage) of the alveolus (milk secretion gland). From here the milk will be released upon stimulation with oxytocin via suckling. Choline can be found in milk as free choline, phosphocholine, glycerophosphocholine, sphingomyelin, and phosphatidylcholine, and choline levels within breast milk are correlated with choline levels in maternal blood. Choline consumed via breast milk has been shown to impact blood levels of choline in breast-fed infants – indicating that choline consumed in breast milk is entering the neonatal system. Choline may enter the milk supply either directly from the maternal blood supply, or choline-containing nutrients may be produced within the mammary epithelium. Choline reaches the milk through a transporter specific for choline from the maternal blood supply (against a concentration gradient) into the mammary epithelial cells. At high concentrations (greater than that typically seen in humans), choline can diffuse across the cell membrane into the mammary epithelium cell. At more normal concentrations, it passes via what is believed to be a calcium/sodium-dependent, phosphorylation-related, active transporter into the cell. Human milk is rich in choline, but formulas derived from other sources, particularly soy, have lower total choline concentrations than human milk. Bovine milk and bovine-derived formulas had similar or higher glycerophosphocholine compared to human milk, and soy-derived formulas had lower glycerophosphocholine content. Phosphatidylcholine and sphingomyelin concentrations were similar between bovine formulas and human milk, but soy-derived infant formulas had more phosphatidylcholine than human or bovine sources. Soy-derived formulas had less sphingomyelin than human milk, which is a concern, since sphingomyelin is used for producing myelin, which insulates neurons. Free choline concentrations in mature human milk were 30–80% lower than those found in bovine milk or formulas. Mature human milk also has lower free choline than colostrum-transitional human milk. Phosphocholine is particularly abundant in human milk. Choline is a precursor to trimethylamine, which persons suffering from trimethylaminuria are unable to break down. Persons with this disorder may suffer from a strong fishy or otherwise unpleasant body odor, due to the body's release of odorous trimethylamine. A body odor will occur even on a normal diet – i.e., one that is not particularly high in choline. Persons with trimethylaminuria are advised to restrict the intake of foods high in choline; this may help to reduce the sufferer's body odor. Choline can be obtained with a variety of counterion. Choline chloride is a major nutritional supplement for example. The salicylate salt of choline is used topically for pain relief of aphthous ulcers. Choline hydroxide is a phase transfer catalysts for hydroxide. It is used for stripping photoresists in circuit boards. Choline hydroxide slowly degrades into trimethylamine. The tartrate is also known. ^ Percentage of diet calculated using 2500 daily calories for an average adult male and 550mg for Adequate Intake (AI) using the figures from the table. As an example, even though peanuts contain some choline, they are a poor source given their 237% of diet to meet AI requirement, which means that a person who ate nothing but peanuts would have less than half of AI. Nearly identical figures are obtained for an average adult female when using 2000 calories and 425mg as assumptions; therefore, separate columns for male and female are not necessary. ^ a b "Choline". Human Metabolome Database. The Metabolomics Innovation Centre, University of Alberta, Edmonton, Canada. 17 August 2016. Retrieved 13 September 2016. ^ a b c d e f g h i j k l m "Choline". Micronutrient Information Center, Linus Pauling Institute, Oregon State University, Corvallis, Oregon. February 2015. Retrieved 10 January 2017. ^ a b c d e Zeisel SH; da Costa KA (November 2009). "Choline: an essential nutrient for public health". Nutrition Reviews. 67 (11): 615–23. doi:10.1111/j.1753-4887.2009.00246.x. PMC 2782876. PMID 19906248. ^ "Choline". NIH. U.S. National Library of Medicine. National Center for Biotechnology Information. 2 September 2017. Retrieved 8 September 2017. ^ a b Zeisel, Steven H. (2012). "A Brief History of Choline". Annals of Nutrition and Metabolism. 61 (3): 254–258. doi:10.1159/000343120. PMC 4422379. PMID 23183298. ^ Boldyrev, A. A. (14 April 2012). "Carnosine: New concept for the function of an old molecule". Biochemistry (Moscow). 77 (4): 313–326. doi:10.1134/S0006297912040013. PMID 22809149. ^ "Choline Overview". CholineInfo.org. Retrieved 6 January 2012. ^ Glier, Melissa B.; Green, Timothy J.; Devlin, Angela M. (2014). "Methyl nutrients, DNA methylation, and cardiovascular disease". Molecular Nutrition & Food Research. 58 (1): 172–182. doi:10.1002/mnfr.201200636. PMID 23661599. ^ a b c Wiedeman, Alejandra M.; Barr, Susan I.; Green, Timothy J.; Xu, Zhaoming; Innis, Sheila M.; Kitts, David D. (16 October 2018). "Dietary Choline Intake: Current State of Knowledge Across the Life Cycle". Nutrients. 10 (10): 1513. doi:10.3390/nu10101513. ISSN 2072-6643. PMC 6213596. PMID 30332744. ^ "Full Report (All Nutrients): 12036, Seeds, sunflower seed kernels, dried; Release 28". USDA National Nutrient Database. May 2016. Retrieved 29 August 2017. ^ Gossell-Williams M, Fletcher H, McFarlane-Anderson N, Jacob A, Patel J, Zeisel S (December 2005). "Dietary intake of choline and plasma choline concentrations in pregnant women in Jamaica". The West Indian Medical Journal. 54 (6): 355–9. doi:10.1590/s0043-31442005000600002. PMC 2438604. PMID 16642650. ^ "Food Composition Databases Show Nutrients List (Search for nutrient choline)". ndb.nal.usda.gov. Retrieved 17 April 2019. ^ Choline. IN: Dietary Reference Intakes for Thiamin, Riboflavin, Niacin, Vitamin B6, Folate, Vitamin B12, Pantothenic Acid, Biotin, and Choline. National Academy Press. 2001, PP. 390-422. ^ Nutrient Reference Values for Australia and New Zealand, Although choline is essential, there appear to have been no reports of deficiency in the general population. Deficiencies have been seen in experimental situations and also in total parenteral nutrition (Buchman et al. 1992, 1993, 1995, Chalwa et al. 1989, Shapira et al. 1986, Sheard et al. 1986). ^ "Dietary reference values: EFSA publishes advice on choline". European Food Safety Authority, Parma, Italy. 17 August 2016. Retrieved 10 January 2017. ^ Bidulescu A, Chambless LE, Siega-Riz AM, Zeisel SH, Heiss G (2009). "Repeatability and measurement error in the assessment of choline and betaine dietary intake: the Atherosclerosis Risk in Communities (ARIC) study". Nutrition Journal. 8 (1): 14. doi:10.1186/1475-2891-8-14. PMC 2654540. PMID 19232103. ^ Shaw, GM; Carmicheal, SL; Yang, W; Selvin, S; Schaffer, DM (2004). "Periconceptional dietary intake of choline and betain and neural tube defects in offspring". Am J Epidemiol. 160 (2): 102–9. doi:10.1093/aje/kwh187. PMID 15234930. ^ What We Eat In America, NHANES 2013-2014. ^ Leermakers, Elisabeth T.M. ; Moreira, Eduardo M.; Kiefte-De Jong, Jessica C.; Darweesh, Sirwan K.L. ; Visser, Thirsa; Voortman, Trudy; Bautista, Paula K.; Chowdhury, Rajiv; Gorman, Donal; Bramer, Wichor M.; Felix, Janine F.; Franco, Oscar H. (2015). "Effects of choline on health across the life course: A systematic review". Nutrition Reviews. 73 (8): 500–22. doi:10.1093/nutrit/nuv010. PMID 26108618. ^ "21 CFR 107.100: Infant formula; Nutrient requirements; Nutrient specifications; Choline content". Code of Federal Regulations, Title 21; Food and Drug Administration. 1 April 2016. Retrieved 20 December 2016. ^ a b c d e Zeisel, SH (2006). "Choline: critical role during fetal development and dietary requirements in adults". Annu. Rev. Nutr. 26: 229–50. doi:10.1146/annurev.nutr.26.061505.111156. PMC 2441939. PMID 16848706. ^ King, JC (2000). "Physiology of pregnancy and nutrient metabolism". Am J Clin Nutr. 71: 1218S–1225S. ^ Morgane, PJ; Mokler, DJ; Galler, JR (2002). "Effects of prenatal protein malnutrition on the hippocampal formation". Neurosci Biobehav Rev. 26 (4): 471–483. doi:10.1016/s0149-7634(02)00012-x. ^ Oshida, K; Shimizu, T; Takase, M; Tamura, Y; Shimizu, T; Yamashiro, Y (2003). "Effects of dietary sphingomyelin on central nervous system myelination in developing rats". Pediatric Research. 53 (4): 589–593. doi:10.1203/01.pdr.0000054654.73826.ac. PMID 12612207. ^ Sastry, BV (1997). "Human placental cholinergic system". Biochem Pharmacol. 53 (11): 1577–1586. doi:10.1016/s0006-2952(97)00017-8. ^ Sastry, BV; Sadavongvivad, C (1978). "Cholinergic systems in non-nervous tissues". Pharmacol Rev. 30 (1): 65–132. PMID 377313. ^ Lockman, P. R.; Allen, D. D. (2002). "The transport of choline". Drug Development and Industrial Pharmacy. 28 (7): 749–71. doi:10.1081/DDC-120005622. PMID 12236062. ^ Caudill, M (2010). "Pre and Postnatal Health: evidence of increased choline needs". American Dietetic Association. 110 (8): 1198–1206. doi:10.1016/j.jada.2010.05.009. PMID 20656095. ^ Holmes-McNarry, MQ; Cheng, WL; Mar, MH; Fussell, S; Zeisel, SH (1996). "Choline and choline esters in human and rat milk in infant formulas". Am J Clin Nutr. 64 (4): 572–6. doi:10.1093/ajcn/64.4.572. PMID 8839502. ^ a b Ilcol, Y.O. ; et al. (2005). "Choline status in newborns, infants, children, breast-feeding women, breast-fed infants, and human breast milk". Journal of Nutritional Biochemsitry. 16 (8): 489–499. doi:10.1016/j.jnutbio.2005.01.011. PMID 16043031. ^ James AR. Hormone Regulation of Choline Uptake and Incorporation in Mouse mammary Gland Explants. Exp Biol Med (Maywood). 2004 Apr;229(4):323–6. ^ Chao, CK; Pomfret, EA; Zeisel, SH (1988). "Uptake of choline by rat mammary gland epithelial cells". Biochem J. 254 (1): 33–8. doi:10.1042/bj2540033. PMC 1135035. PMID 3178755. ^ Chiao-Kang et al. Uptake of choline by rat mammary-gland epithelial cells. Biochem J. (1988) 254, 33–38. ^ Banapurmath, CR; et al. (1996). "Developing brain and breastfeeding". Indian Pediatrics. 33: 235–38. ^ Tram, TH; et al. (1997). "Sialic acid content of infant saliva: comparison of breast fed with formula fed infants". Archives of Disease in Childhood. 77 (4): 315–318. doi:10.1136/adc.77.4.315. PMC 1717361. PMID 9389234. ^ Holmes-McNary, M; Cheng, WL; Mar, MH; Fussel, S; Zeisel, SH. "Choline and choline esters in human and rat milk and infant formulas". Am J Clin Nutr. 1996 (64): 572–6. ^ Mitchell SC, Smith RL (2001). "Trimethylaminuria: the fish malodor syndrome". Drug Metab Dispos. 29 (4 Pt 2): 517–21. PMID 11259343. ^ Sedlak, Rudy (2009). "The Technology of Photoresist Stripping". Retrieved 27 November 2013.